This is the old medieval parish church of St Andrew in Enfield, situated to the north of Enfield town's market place. 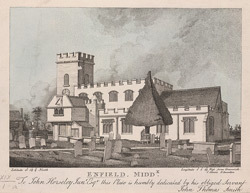 Enfield was the second largest medieval parish in Middlesex. The building has parts dating back to the 13th century, but has had substantial additions and renovations, including in 1789 by Leverton and in 1810 by Lapidge. It is thought that at one time the church belonged to Saffron Walden Abbey, this is supported by the presence of a chantry (which has now been converted to a vestry).